Archive.org is a website full of wonderful scanned genealogy resources. Buried down in all their millions of scanned images is the three volume Chronological Record of Police Appointments City and County of San Francisco. These volumes cover an almost 100 year period, from 1853 to 1947. The three volumes are ledgers that start with an index of names containing the page number for the full entry. After the index, there is a chronological listing of new police recruits. If recorded, there is a fantastic amount of information included for each new recruit: name, date of birth, city or county of birth, state or country of birth, previous occupation, married or single, no. in family, date appointed, age when appointed, date removed, remarks, and length of service. Any record set that has county of origin information for more that 50% of Irish entries is a very valuable genealogical resource. The rate of Irish-born recruits does fall off in the second and third volumes. 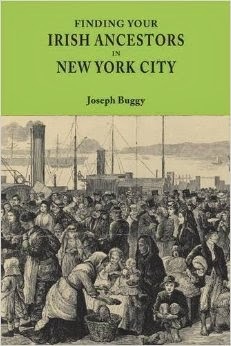 However, they are replaced by first generation Irish-Americans, the sons of the first wave of Irish immigrants. * Chronological Record of Police Appointments City and County of San Francisco, Volume 1, 1853-1904, page 6, entries section, available online at https://archive.org/stream/chronologicalrec1185sanf#page/n125/mode/1up : accessed 2 July 2014.